Paris: Chez Jean Berjon, 1613. 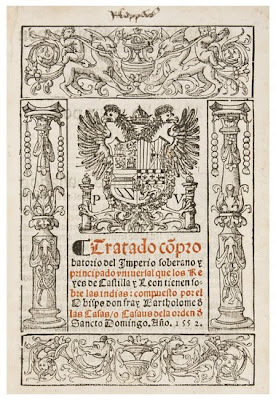 Bloomsbury Auctions, which has been leading the auction world into no- and low-reserve sales, realized twice its estimate for the recent auction of the de Orbe Novo Collection of early books related to the New World 1492-1625, with complete sell-through of all eight-one lots for a total of $3,489,000, or $43,000 per lot. At a time when rare book auctions are typically selling only 70%-75% of lots offered, this is big news. Yet the sale has received zero coverage from the book media. The sale was notable for its extraordinary transparency. A detailed transaction history of the same titles and issue, drawn from the Americana Exchange Database, was provided online. Condition was minutely detailed, and the source of each purchase, price paid and year acquired was also provided. The material, purchased from many of the principal dealers and auction houses in the field, was generally reserved at 60% of prices paid. Lot 12. VARTHEMA, Ludovico di. Itinerario. En el Qual Cueta Mucha Parte de la Ethiopia Egipto; y Entrabas Arabias: Sira y la India… Seville: J. Cromberger, 1520. 55,  ff. including colophon leaf. 4to (275 x 195 mm). Modern crushed red morocco. Condition: closed tears to title neatly repaired, some intermittent light, mostly marginal staining, one leaf with more moderate staining, lower corner of colophon leaf supplied. Acquisition: purchased from William Reese Company (1998), $37,345. [An online footnote links to prior auction results]. Richard Austin, Director of Bloomsbury Auctions, New York said that "Our approach to the presentation of this collection and the wonderful books it contained encouraged the reappearance of established collectors and brought new collectors to the marketplace. 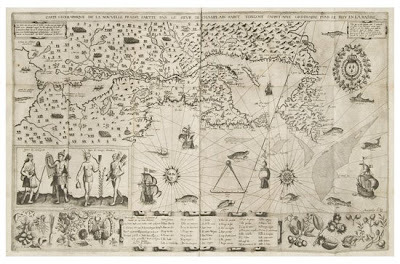 Great books brought strong prices and the magnificent copy of Champlain’s Les Voyages, one of the most important travel books of the 17th century, brought a world record." 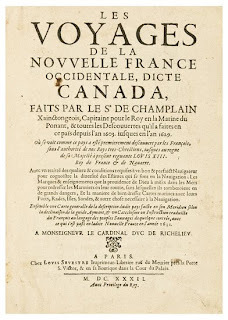 Les Voyages du Sieur de Champlain Xaintongeois... Paris: Chez Jean Berjon, 1613, sold for double the high estimate, at $758,000 ($650,000 plus 20% buyer's premium). This book of European Americana and New World Exploration is a pioneering work in ethnography and contains the first accurate mapping of the New England coast. It is extremely important and quite scarce. This, the Siebert copy, is a first edition, complete, and untouched; not a single repair or alteration of any nature has been made to it in the 397 years since its original printing and binding. Tom Lamb, International Head of Books and Manuscripts at Bloomsbury Auctions said "This tremendously successful sale brought together an international gathering of collectors and their agents competing to secure some of the rarest books on the early history of the Americas. Clients came to Bloomsbury Auctions’ New York saleroom from France, Spain, Italy, England, Canada, and the Americas intent on acquiring these rare works. We were delighted with the results, which are a testament to the collecting acumen of Bruce McKinney." McKinney purchased the books between 1991-2002.. He is the proprietor of the online site for rare books, Americana Exchange. Paris: chez Louis Sevestre, 1632. What is significant is that increases or decreases in value could be immediately determined. Very few books sold for less than the low estimate, most fell somewhere in between, yet many, like the Champlaiin, dramatically exceeded their high estimate. The estimate for Varthema’s En el Qual Cueta Mucha Parte de la Ethiopia Egipto; y Entrabas Arabias: Sira y la India (described above), for instance, was $15,000 - $20,000. It sold for $48,000 (w/o premium). Bloomsbury must be commended for its ongoing efforts to explore how to bring buyers and sellers into the brave new world of collecting rare books by de-mystifying auctions through transparency and realistic reserves. It builds confidence. Wake up, Sotheby’s and Christie’s, both of whom continue to set high reserves to attract consignors, then fail them when the books don't sell. Significantly, and, I believe, without precedent, the open terms of this auction were set by the seller, McKinney. "I required it," he told Book Patrol. "My attitude was 'Let the market decide.' Bloomsbury was initially uncomfortable with the plan but ultimately recognized that they have ongoing relationships with buyers as well as sellers." McKinney has bought at Bloomsbury in the past. Bloomsbury swallowed hard and finally came to grips with McKinney's terms. Auction houses have traditionally catered to the seller by setting high reserves; the consignor was king. McKinney flipped the equation: the consignor was still king but set low reserves. This was a risky bet by Bloomsbury, which has lately experienced difficult times but endured. Not too long ago, auctioneers began to go retail to attract buyers. Now, they have two masters to satisfy and Bloomsbury is listening to both. Listening to both seller and buyer to determine a comfortable and realistic reserve, present prior auction records and the consignor's price paid to assist buyers, would seem to be a no-brainer but some auctioneers, apparently, are operating in the sub no-brain region. Bloomsbury has its thinking cap on. "Let the market decide" is what an auction is supposed to do. Bloomsbury seems to be the only auction house willing to actually allow the market to freely operate and let prices find themselves. Bravo. Collectors like McKinney are to be commended for the courage to allow complete transparency, accept risk, and let a truly open marketplace determine what their books are worth. As most collectors over-value their collections, his approach should serve as a model in today’s rare book market. McKinney took a real leap of faith and succeeded. Bravo, redux. But Bruce McKinney is no ordinary collector. Publishing through Americana Exchange, Bruce has led the way in statistical analysis of rare book auctions. It was, in fact, his analysis of the marketplace, 2002-present, that led him to believe that this was the right time to sell. In short, he put his money where his mouth was, and it was not a leap of faith but complete confidence in his analysis that encouraged him. "I wanted to prove that our statistical analysis worked. It did. It was spot-on." Those dealers concerned that allowing an open market to set prices will force the value of their stock to decline should take heart; no tail-spin occurred, you can return the barf bag to the seat pocket in front of you. Collectors who fear a wholesale loss if they take their collections to auction in this manner should feel fortified. Yet it remains an uncomfortable truth that book auction prices have declined "irreversibly" 33% since 2007. The bubble burst in December of 2008, and those who bought in the years 2006-2008 will feel a degree of pain if they wish to sell; prices are not bouncing back. But the market is righting itself. The far sighted will get back into the market now. And dealers who have yet to lower posted prices while they continue to sell at deep discounts will pay as confidence shifts to those who have the good sense to accept reality and post real-world prices. I suspect that we'll start to see more auction sales conducted in this manner in 2010. This was Bloomsbury's most successful sale ever, exceeding its prior record by 50%. That fact alone will open eyes, wide.